This is a sketch challenge that Bella Blvd had for their DT's using scraps. I just thought the sketch was to cute to pass up and I had the perfect photos to use with it. 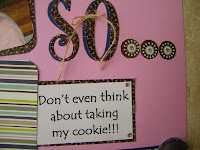 I titled it "Happy So.... Don't Even Think About Taking My Cookie!!!" Love these photos of my grand daughter Annie. I used the Bella Blvd Estate Sale Collection - Bits a Blvd and Nana's Apron along with some Pink, Ming Blue and White card stock. 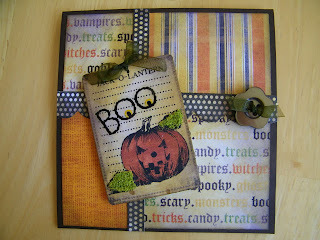 Here is the sketch that was posted on Bella Blvd blog if you would like to work up your scraps. I fussy cut one of the strips to make the diamond shape border that I added to my labels. I also added some of the tan string and buttons to each. 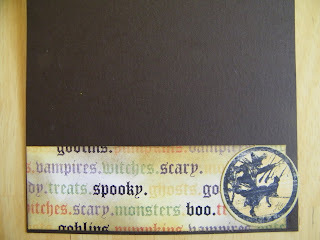 I stapled the small word stripes on with the Tim Holtz tiny attacher. Love that attacher!!! My "SO" is the Quickutz English Rose font. I punched my circles from a 5/8" circle punch. My journaling I did on the computer in Microsoft Word Doc Tempus San ITC (26). 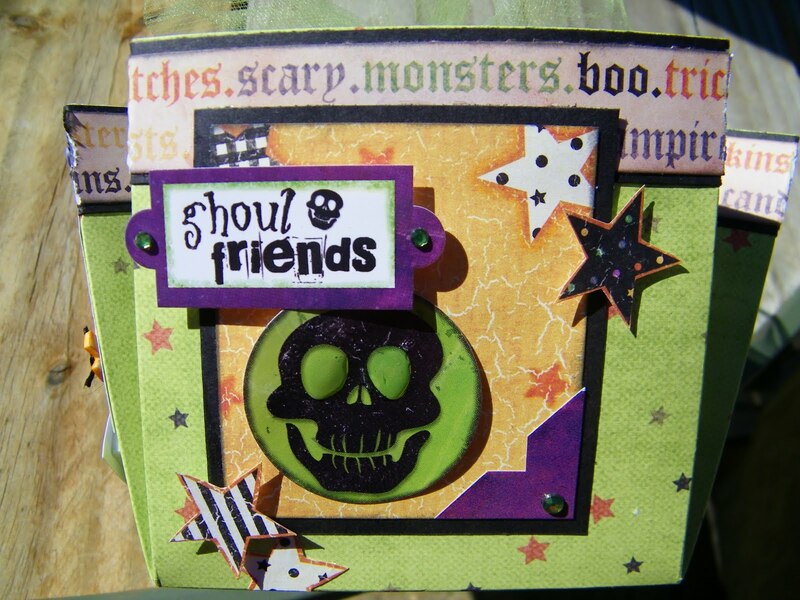 Added some pink gemstones to each corner and the centers of the circle punches. 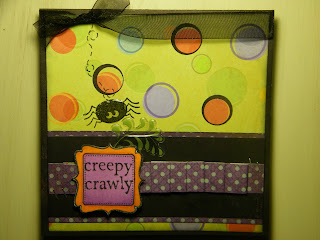 I created my "Creepy Crawly" Halloween card using some of IMAGINISCE products that I had on hand. They are having a card challenge on their blog and you needed to make a card using the colors black, purple, green and orange and post your card here before Nov. 1st, 2010. I actually made two, I will post the second tomorrow. I made these fabulous pleats using my new Martha Stewart Scoreboard. 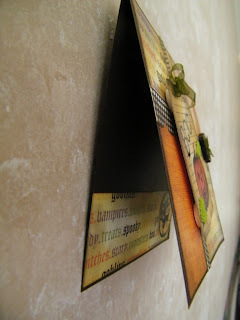 I scored the paper every 1/2" and just folded it and attached it to my ebony paper with the Tim Holtz Tiny Attacher. 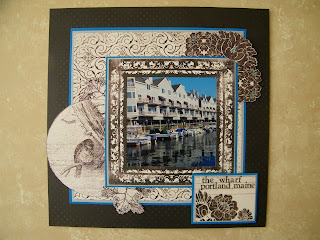 Here is a side view showing that I used the Imaginisce Frame stamp and placed it on pop dots after I colored it in. I also place an Imaginisce Falling Leaf sticker behind it. 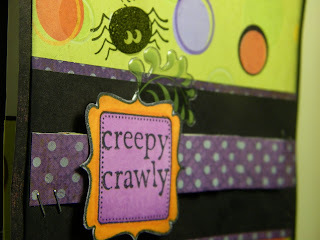 My little spider that is coming down is part of the Happy Halloween stamp from where the "Creepy Crawly" sentiment is on. I added a little Glossy Accent to the spider to give him just a little dimension. I stamped my frame using Memento Tuxedo Ink and used Copic Markers: YR04, YR07, V12, and V15. Here is an inside view from the left side of the card. 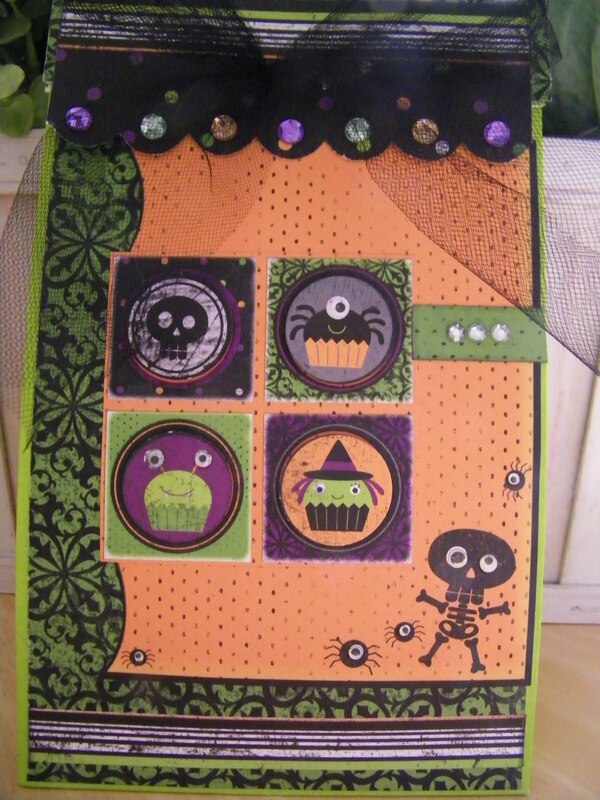 I included some of the the Dino Roar Primordial paper to the bottom of the inside of the card along with some of the stamped spiders. The Dino Roar Primordial had brown circles so I had to use a 5/8" punch and punch some black circles an place over the brown so I would be able to stay in the color theme that was required. 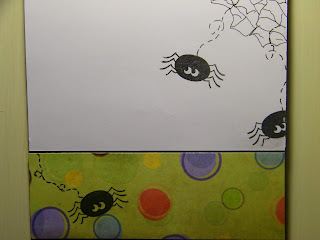 Here is a better look at my little spiders from the Imaginisce Happy Halloween stamp. I drew my spider web up in the right corner with a Black Zig pen. 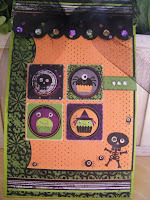 Take a visit to Glue Arts and see the fun Boo Game that they are wanting us to participate in. 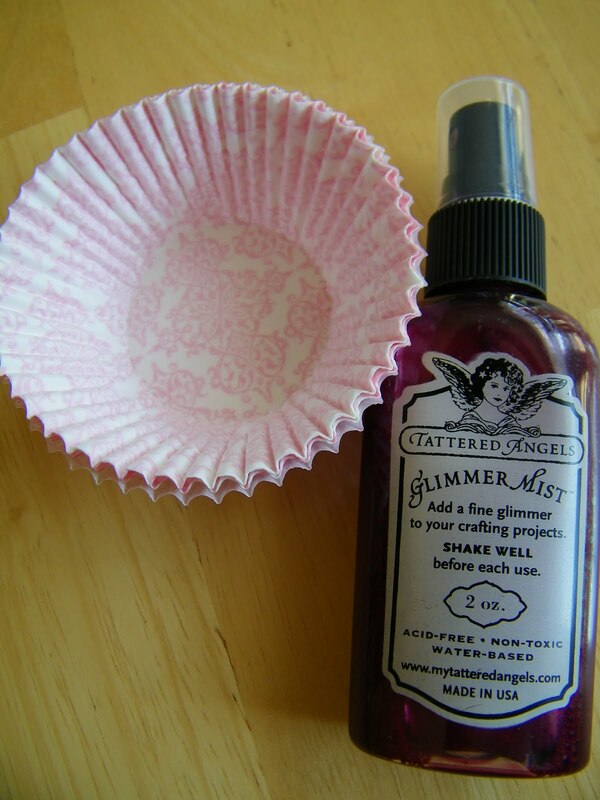 You can't fail with Glue Arts I love their products and if you haven't ever try it, I would if I were you. 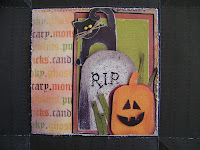 Never to early to think about Halloween layouts. 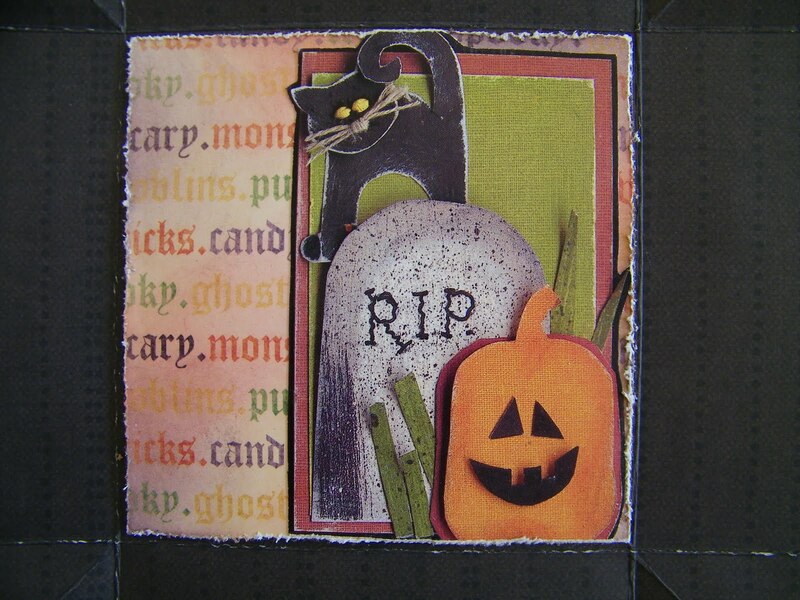 I did this one a few years ago using the Basic Grey Color Me Silly paper and embellishments. Autumn was dressed as Ariel and she is just to pretty for words. 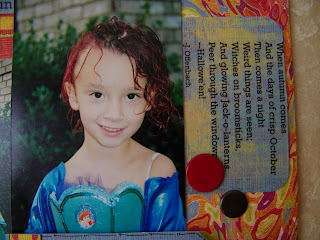 Her momma even went as far as to color her hair. 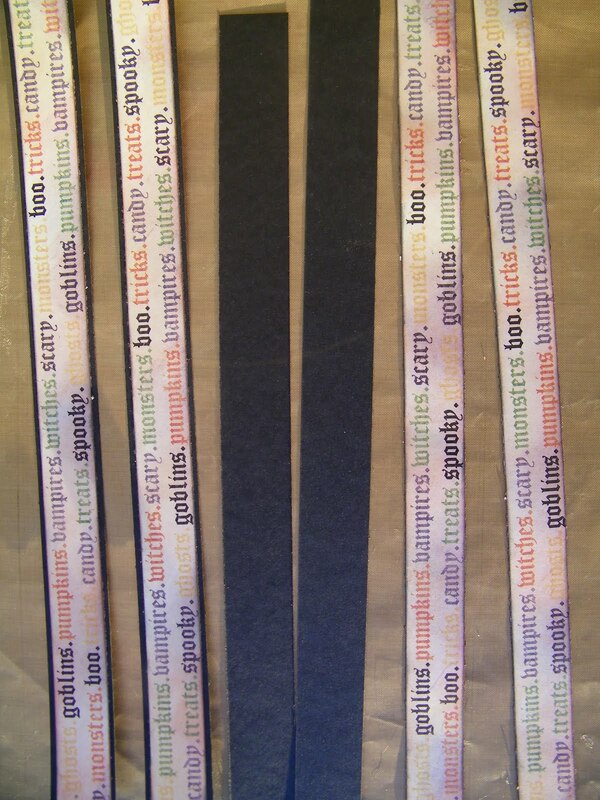 I love poems, brads, ribbon so this layout went together very quickly. 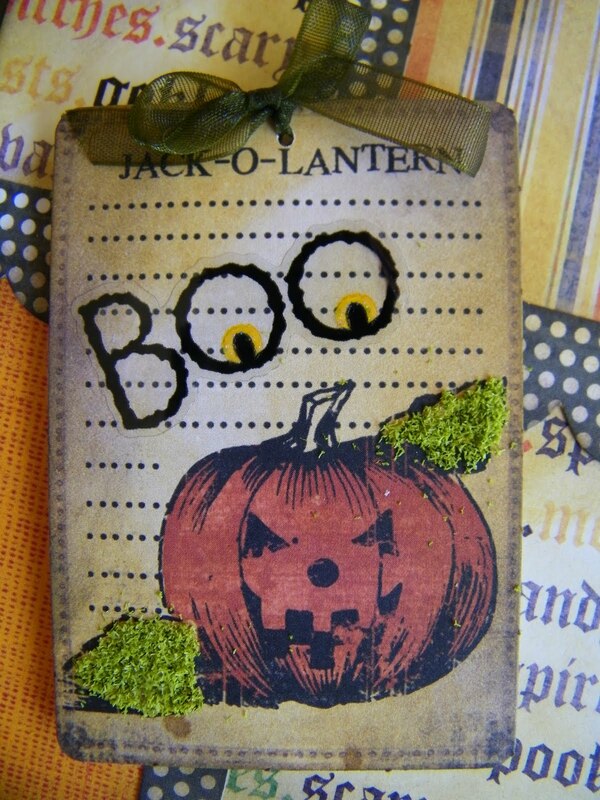 "When Autumn comes and the days of crisp October then comes a night weird things are seen. Witches on broomsticks and glowing Jack-o-Lanterns peer through the windows on Halloween"
October is Breast Cancer Awareness month. I am so thankful for SRM and It Takes Two Paper. One would think that there would be more out there for breast cancer but I have been looking and am so surprised on how limited the products are. So I was so glad to find these stickers and paper to make this card for someone special in my life that is finishing up her breast cancer treatments. Cancer in the last few years seems to touch every corner of my life. I have lost both parents to cancer, now watching family and friends either struggle with it or have lost their battles with it. It just saddens my heart. 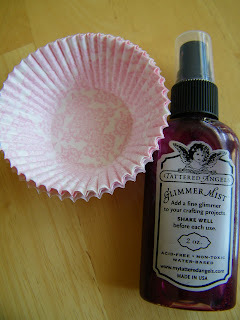 I used Glimmer Mist and cupcake liners for my flowers. I took 4 liners and cut them to measure about 3" in diameter, sprayed them with my Glimmer Mist and the scrunched the up and allowed them to dry. Once dry I open them up carefully and stacked them on top of each other. I held them together with a brad and used one of the SRM Stickers on top of a 5/8" circle as my center of the flower. I placed the center on a pop dot. I cut my flowers from the Breast Cancer Awareness Cartridge and added them with my SRM stickers to the front of my card. I added some Crystal Stickles and small pearl gemstones to the center of each flower. 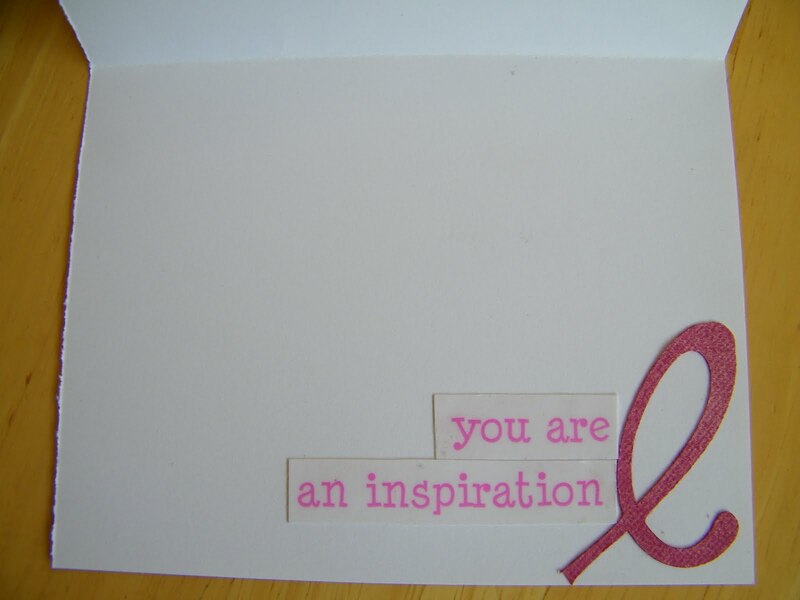 I added another sticker to the inside of the card with a ribbon that I cut from my Cricut Breast Cancer Awareness Cartridge. 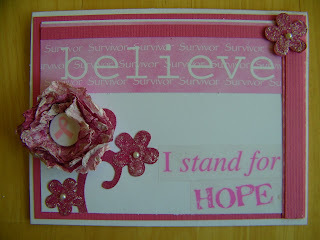 Remember those this month that have won or are fighting not only with breast cancer but with any cancer. Lift them in prayer, wrap them with encouragement and hold them with love. 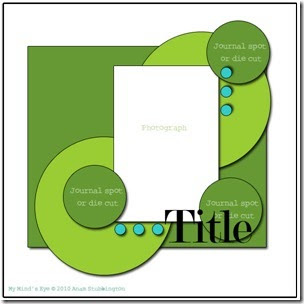 My Minds Eye Blog Challenge #16 is on a sketch designed by Anam Stubbington. We were to do it in black, not the easiest to come up with but I used the Meadowlark Dawn Collection and two different cardstock to bring the blues out of my photo and I think it turned out to be an awesome layout. 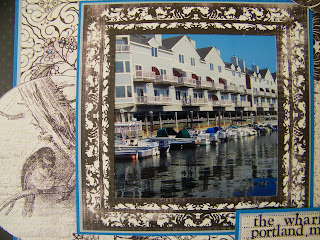 I called it "The Wharf" because we went to the wharf in Portland ME to get lobsters for supper. It was the most beautiful place with all of the boats in their slips. 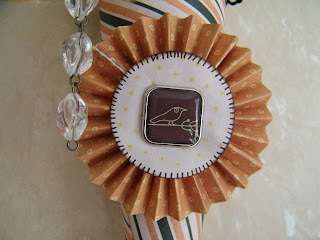 Notice how I fussy cut the Damask paper to make my flowers and around the circle of the bird. It is a simple way to add great dimension to the page. Glue Dots, Glue Arts and Blue gemstones. 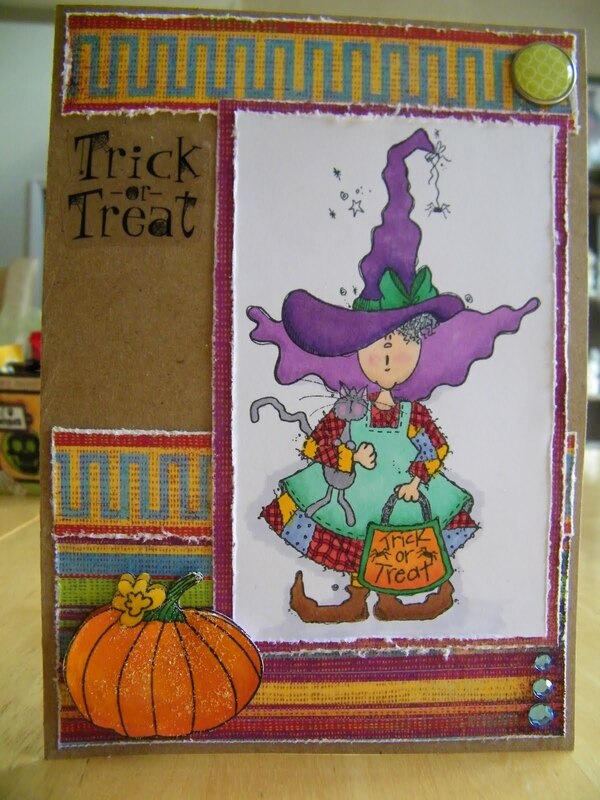 This is Cindy Stevens sketch that is being featured over on the Imagininsce blog. 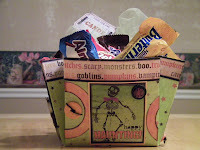 If you enter you have a chance to win a $75.00 prize from Imagininsce - you have until Oct 25th to link up your entry. I have tried many, many times but so far I have not won but the most important thing is the sketches - they are always fabulous. 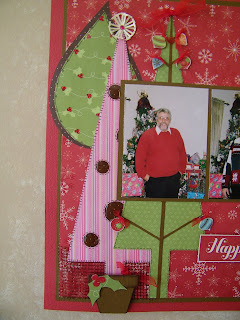 I love this one that Cindy sketched and selected a photo of my husband and I in front our Christmas tree. 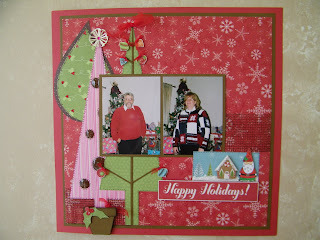 I used the Cottage Christmas Collection and a couple of pieces from the Lucy Bird collection to design my layout. 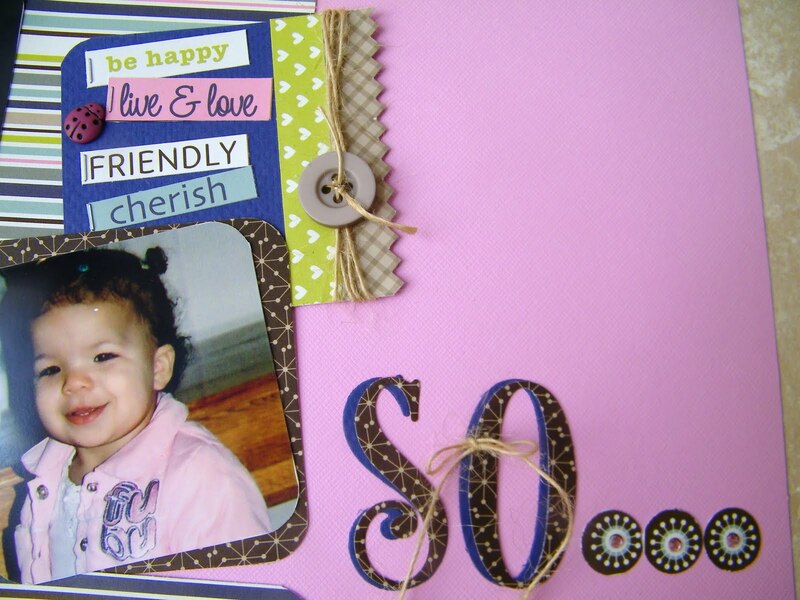 I also used my Cricut Expression and 2 different cartridges to make my border strips that I added to the page. I wanted to mimic the trees that are on Cottage Collection Winter Woods, so the trees became my strips. I fussy cut the ornaments from one of the papers. I made sure that I had two of each so I could glue one down at the end of each branch I freehand and cut to place on one of my large trees. I then put its mate on top with a pop dot so that the ornaments would have dimension, added a very small ribbon and some glossy accent to each. I used my zig pen to do all my stitch and line work on my pieces. On my tree that looks like a large leaf I added small red gemstones on the holly leaves. The tall Daisy May pink tree has holes in it and is layer on top of the Flower Power brown dot. I filled my holes with glossy accent. If you don't have this cartridge just draw triangles and punch some holes in your tree with some different size hole punches. My star on top of my tree is from the Snowflakes Quickutz die, but again you can use any star. 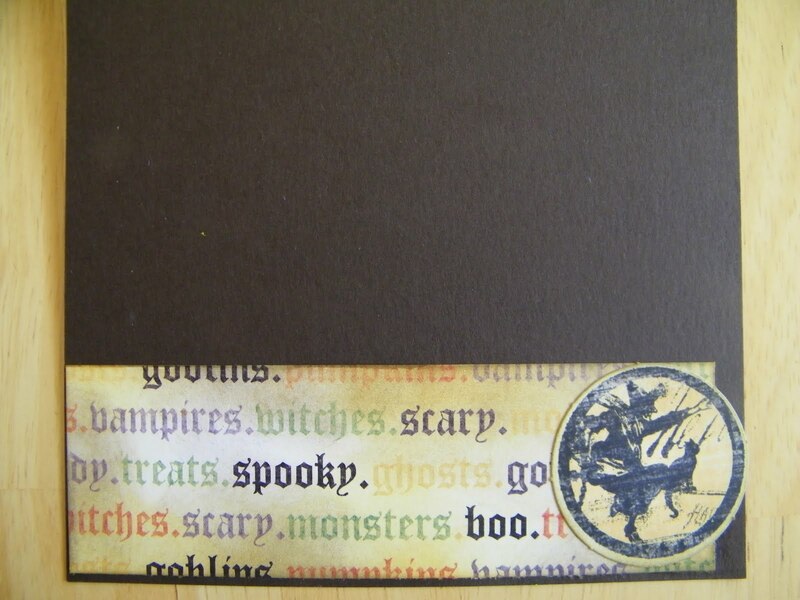 I used the strips from Christmas Countdown for my journaling, and added some brown Magic Mesh to my layout. I hand cut my flower pot for my tall pink tree and made some holly for the top of the pot; place the pot on page with pop dots. 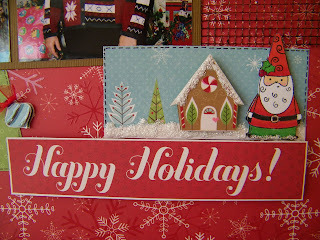 I cut an extra house and placed it on top of the strip with pop dots to go along with my stamped Santa. I colored him in with Copic Markers and added some stickles to the roof of the house and the snow on the ground. He is also on pop dots. 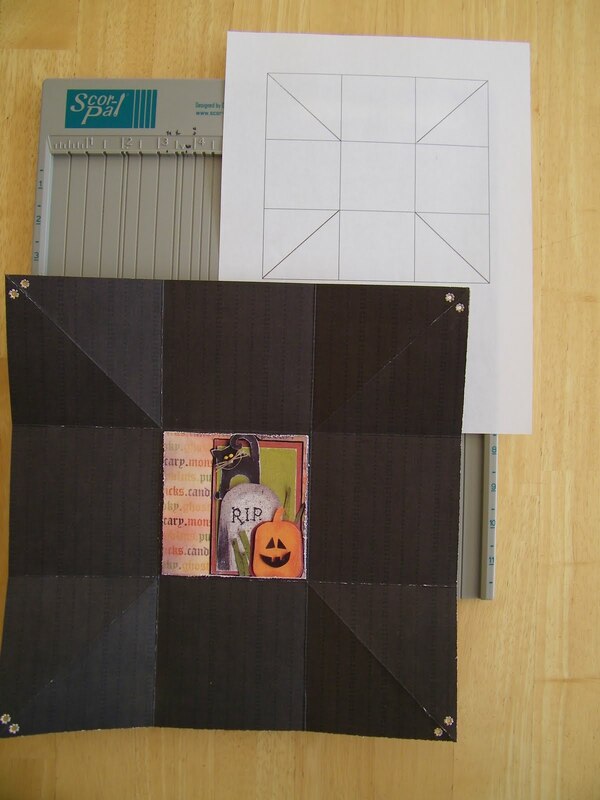 I used a 8" x 8" piece of My Minds Eye Halloween paper and made a cone. I started the cone on one corner of the square, wisting it around a pencil. 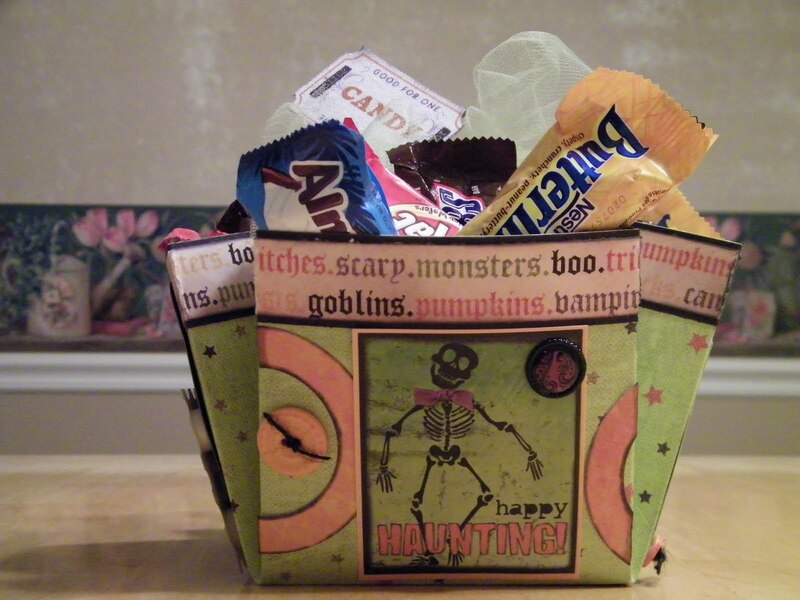 Make sure you don't twist it to tight you want to be able to get your candy in it. I held it together and used my Quick Dry glue to glue it together. I then used two way tape and added my black ribbon to the top and then intertwined the orange sheer through the top of the black ribbon. I punched two small holes using a 1/8" punch on each side of the cone and added some wire for the handle that I twisted around a pencil. 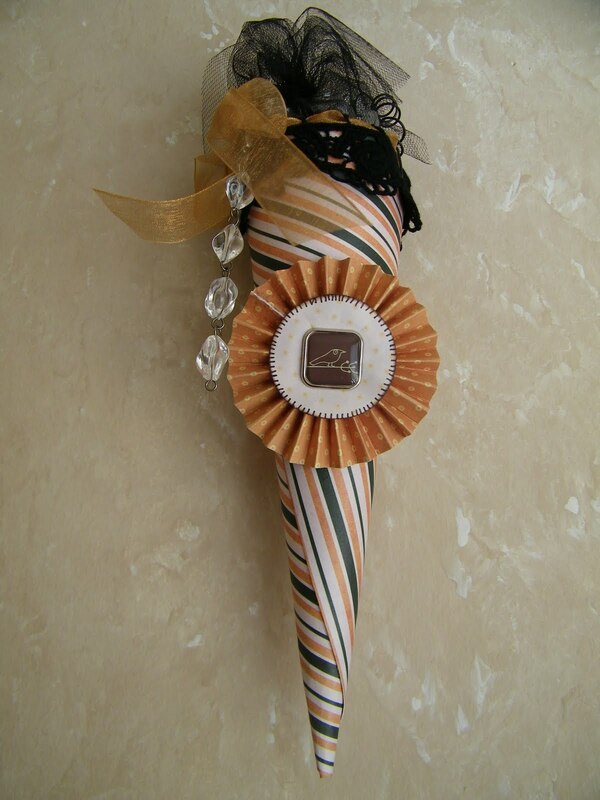 Once the handle is in place I added the beads and tie the orange ribbon. The scallop circle is really easy to make. Punch two 1 1/4" circles (or the size you will need for the center of the scallop, this will always depend on the size of the scallopyou are making). For this one cut a strip of paper that is 1" x 12" and do an accordion fold every 1/16" (the closer the fold the better I think it looks). Once you have it completely folded glue the two ends together. 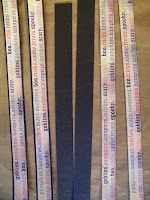 (I think a low temp heat gun or two way sticky tape is the easy way to adhere it to one of your pre-cut circles.) 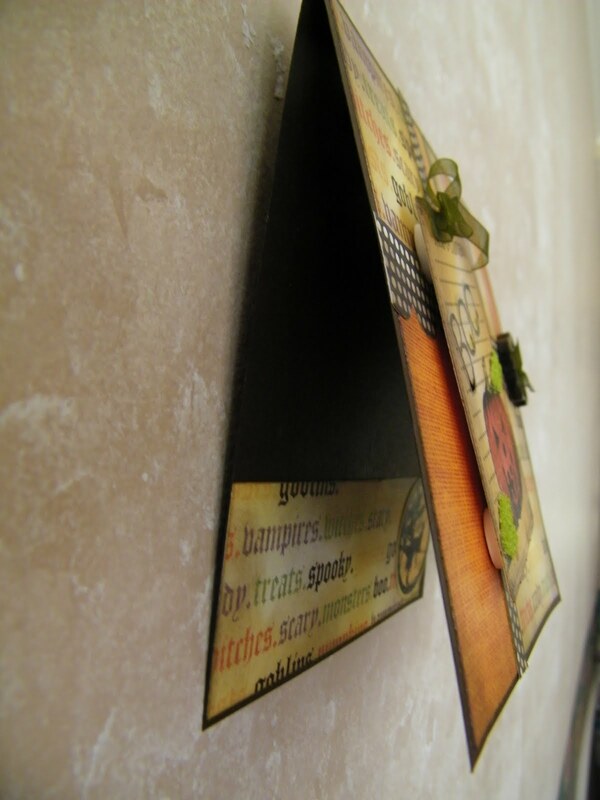 Once you get the ends glued push it down on to the pre-glued circle and hold it into place. Add the second circle to the top in the same manner. Decorate the outside to go with your occasion, mine is for Halloween. I added a embellishment from the Making Memories Blackbird Brads and did some stitching using a Black Zig pen to my circle before I adhered it to the cone. I used glue dots to stick my accordian folded circle to the front of the cone. 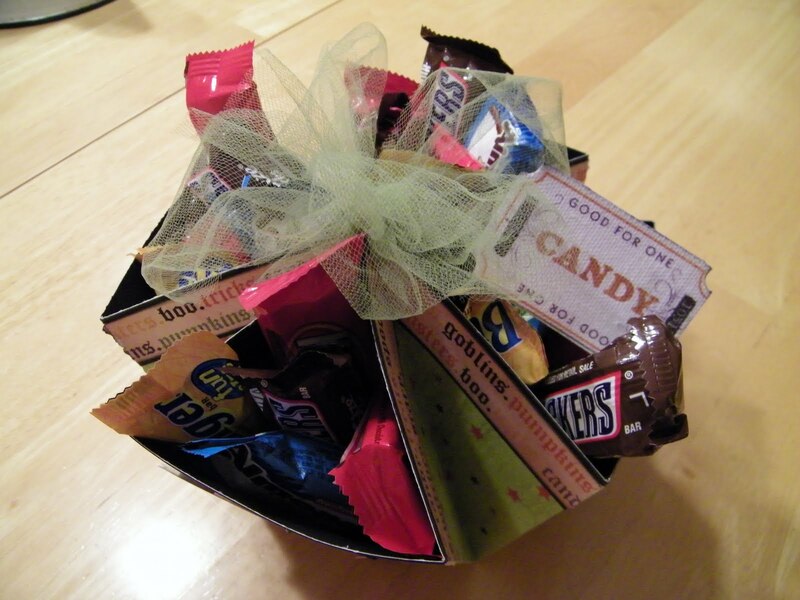 I placed some tulle in the inside of my cone and filled it with my candy, but you can use cellophane bags as well. 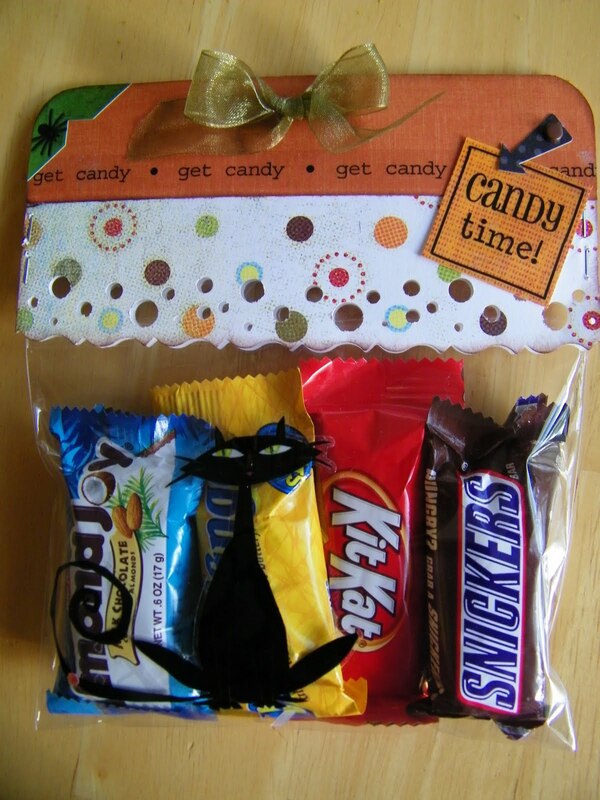 Make sure to tie the tulle closed at the top so you candy doesn't fall out. 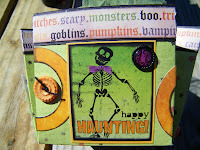 I made this Boo Card using My Minds Eye Halloween Papers, Glue Arts, Flower Soft and Tim Holtz Distressing Inks. Just thought it looked fun. I decided I would ink the papers with the Tim Holtz Wild Honey and Dusty Concord to make it look more vintage, not that My Minds Eye needs any help. This paper is gorgeous with out the distress look. I have just started using Flower Soft. Love it. The color I am using is Sage. 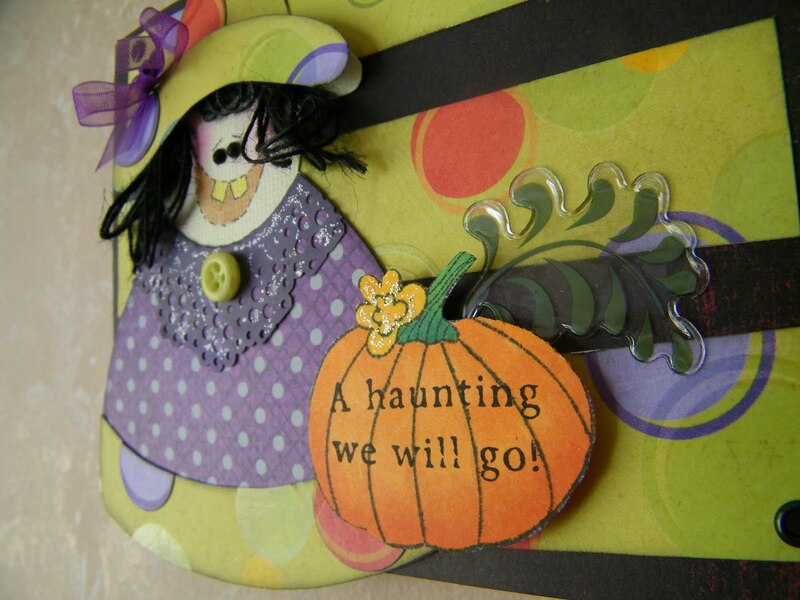 Makes my leaves on my pumpkin just pop off the card. I also added a Paper Studio Spooky Halloween Stickabilities Sticker to the tag. 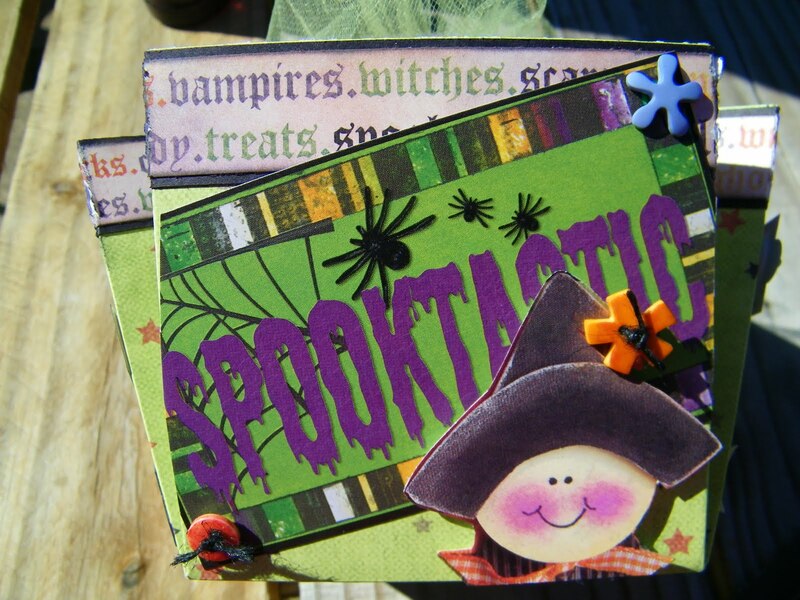 I added a strip and another tag to the inside of my card. I seen a card challenge at Paper Patch Crafts and then a challenge with Simon Says Stamps. 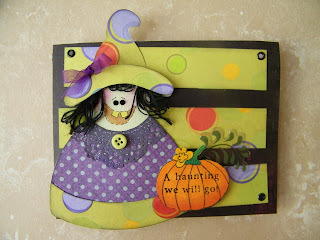 I thought well I will combine the two, you can see the sketch challenge that is at Paper Patch Crafts and then link there and also to the challenge at Simon Says Stamps. I made my Witchy Witch Card with my Penny Black Stamp Treatin' Witch. I love whimsical. Love the colors of fall, the crisp air, the excitement in the air. 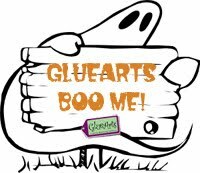 You can feel the hustle and bustle of everyone getting ready for school, Halloween, Thanksgiving and the anticipation of Christmas. 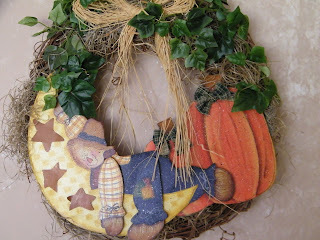 Here is a wreath that I did a few years ago, I love fall decorations. I miss painting, I use to do it as much as I scrapbook, paper craft and card making now. I still paint but not like I use to. 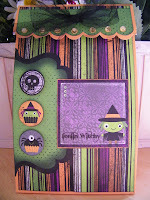 I am excited that I am able to use some of my talent with the Chip Art Tool that Melody Ross has out. Love that tool. 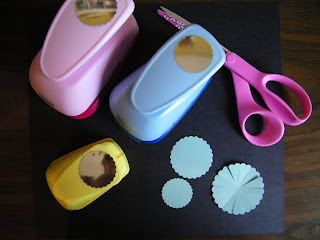 I am always looking for ways to paper craft with materials that I already have. 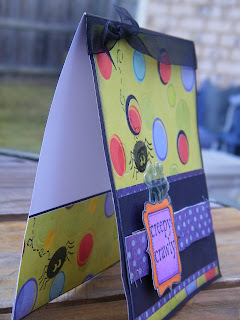 This is a candy box that I made using one piece of double sided paper for the "Featured Artist" spot on Ideas for Scrapbooking. I was asked to make something that would encourage creativity and I thought what a great way just to use some of the supplies I had on hand. 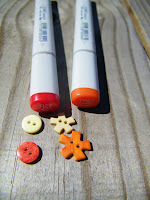 I also will show you that your are able to use your Copic Markers to color on buttons. To start score your 12" x 12" double sided paper at the 4" and 8" score lines on your Score Pal or other scoreboard. 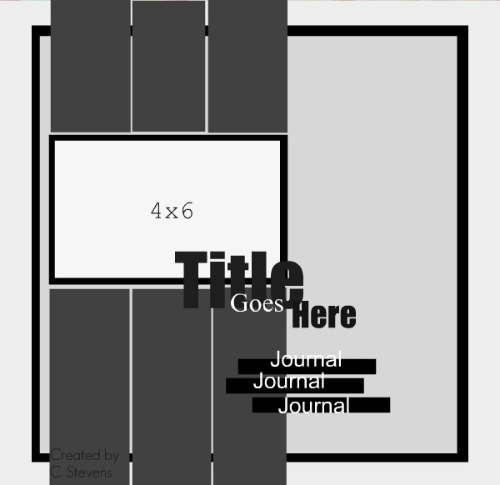 Turn the paper and score again on the 4" and 8" score lines so that you form intersections. On each corner score diagonally to the corner of the center square. 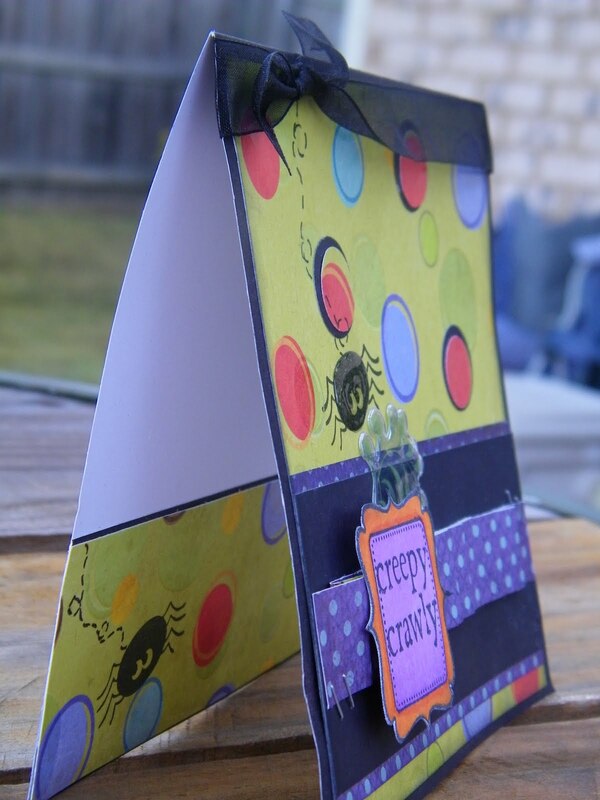 Fold sides up and corners in when finished so they will form your candy dish. Open the paper back up and lay where the inside is facing up. 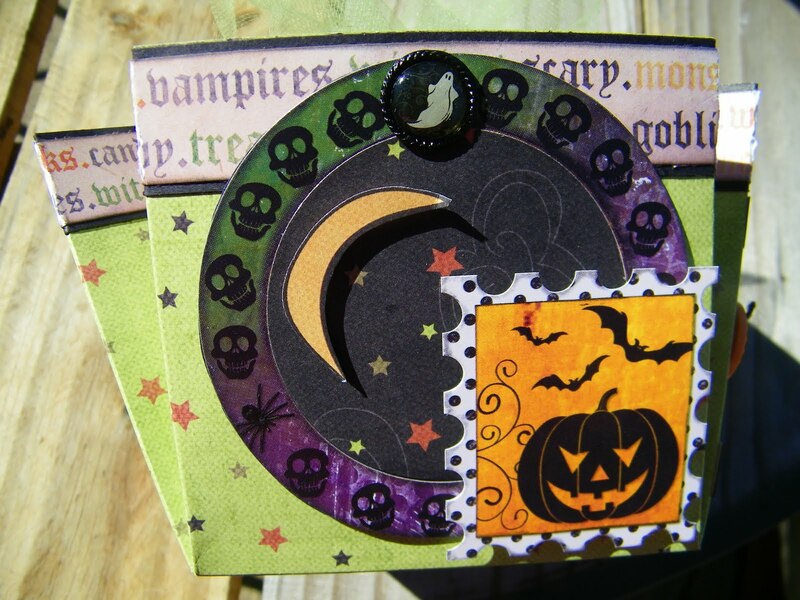 I decorated the inside of my center square with some My Minds Eye Halloween paper and a sticker that I had in my sticker stash. 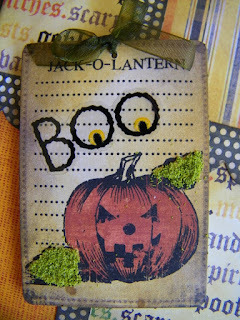 I distressed the paper using the Tim Holtz distress tool. 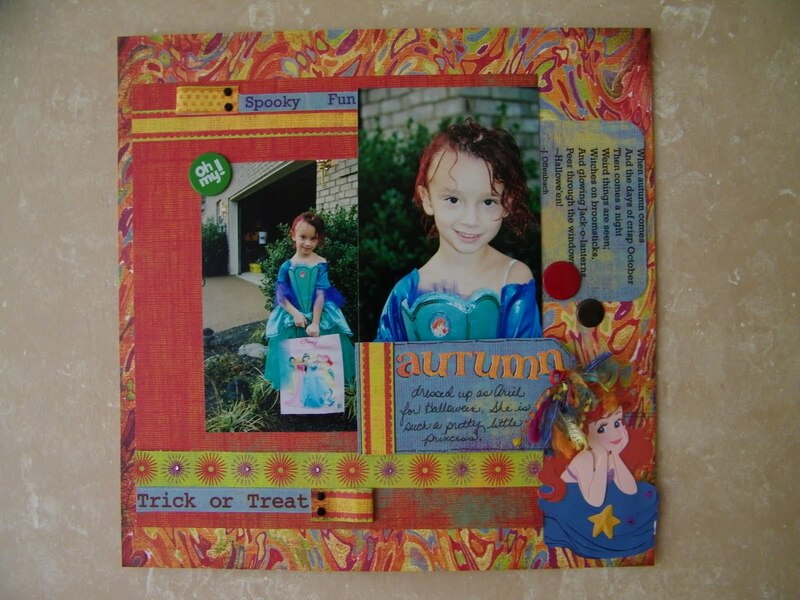 I used Distress Inks and a Blending Tool to distress the paper before I glued into place. The inks were Dusty Concord, Tea Dye and Ageg Mahogany. Once your have the inside square done you are ready to turn over and do the outside. 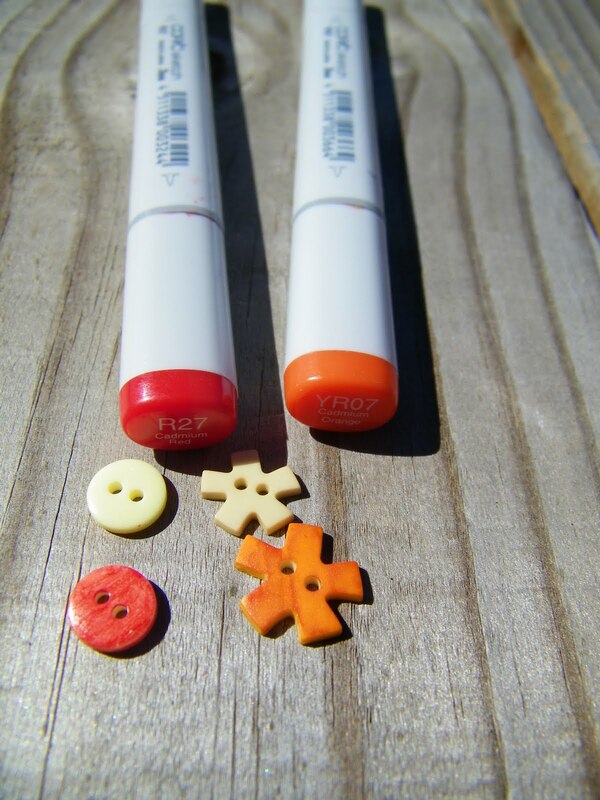 If you don't have the right colored embellishments try coloring them with your Copic Markers, that is what I did to get the color buttons I needed for my project. These are so fun and easy to make. 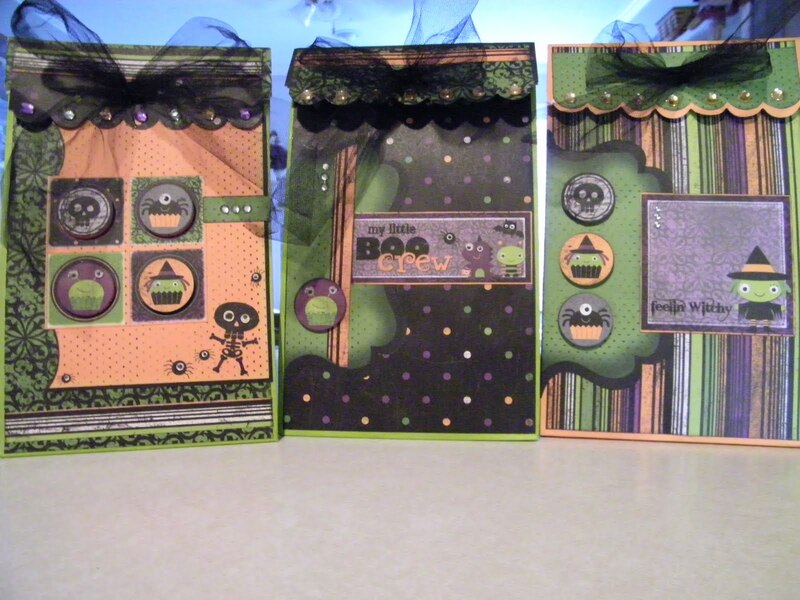 All you need is some of the Bo Bunny Paper Bags, Boo Crew Double Sided Paper, Boo Crew Die Cut Sheet, Boo Crew Embellishments, Colorbox black ink, some black tulle, variety of gemstones. 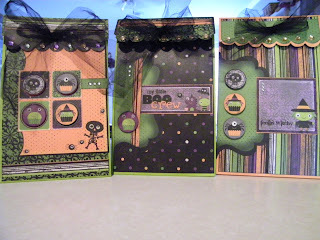 Now you can begin to make up the bags, don't forget pop dots to give added dimension to the bags. These are a great way to give your special trick or treater something a extra as a suprise. NOTE: when you fold the top of the bag down you need to cut some of the under folded part of the bag away- it will help keep the white part of the bag from showing. 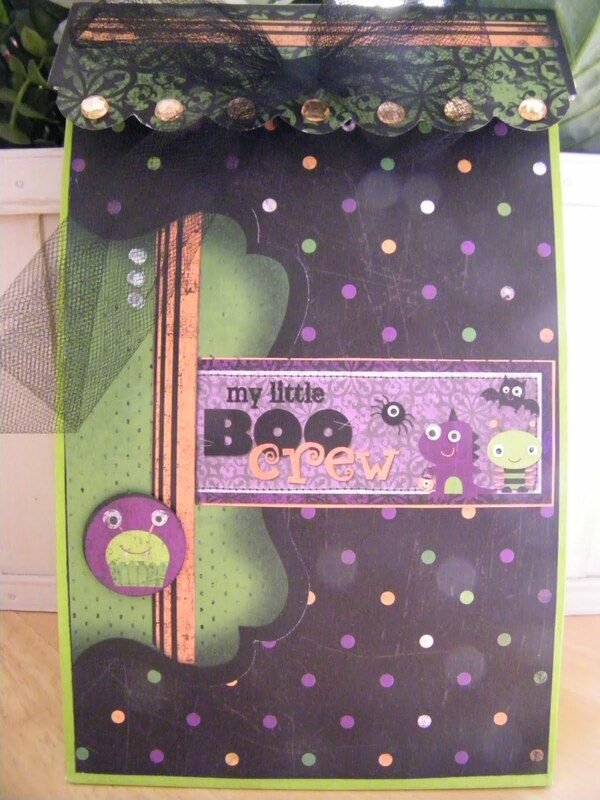 Have fun making your bags and if you don't have Boo Crew Paper any fun Halloween paper will work. 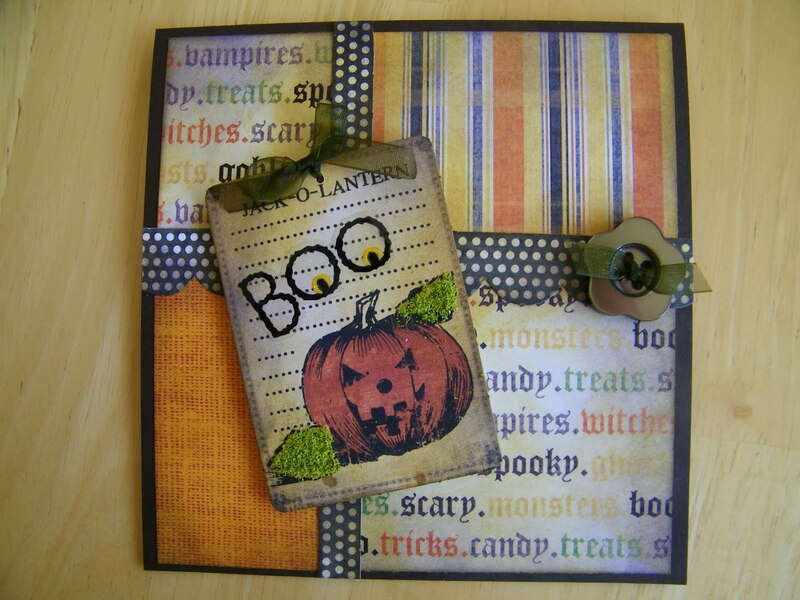 I used papers from American Backyard Collection to do my A2 card for World Card Day. 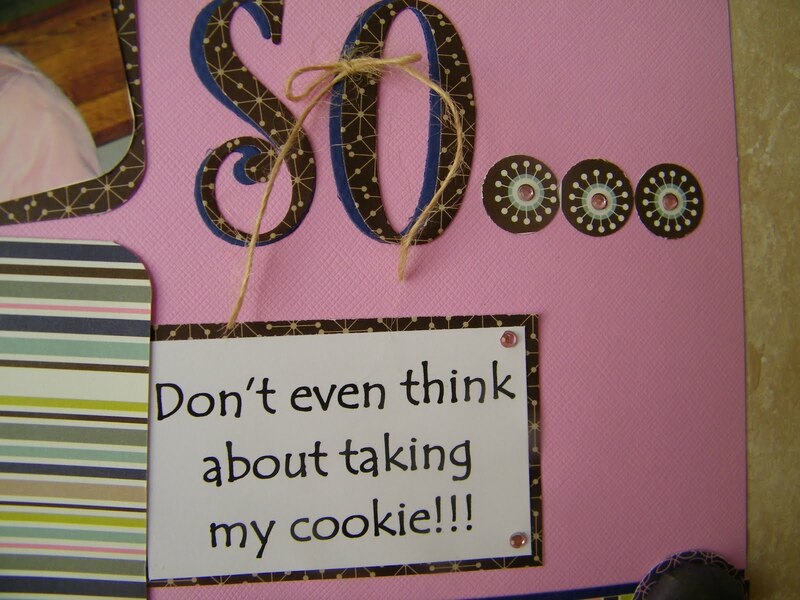 Along with a Backyard Flair embellishment and a sticker from the Remarks Sticker Book. 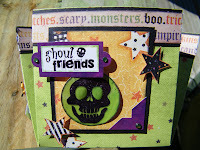 I stamped my sentiment from Hero Arts Friends Stamp. 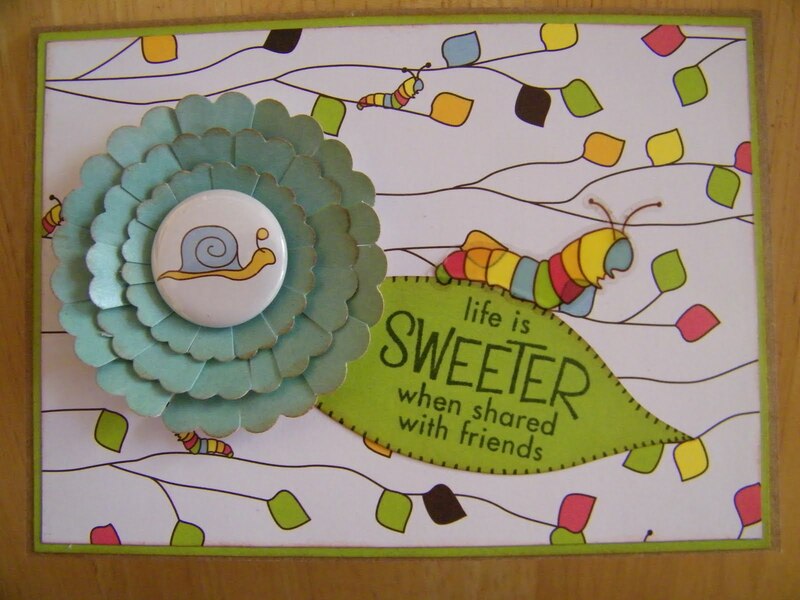 I then hand cut around the sentiment to form the leaf for my flower and added the sticker caterpillar to the top of the leaf. I used my zig marker to mark the stitch lines arund the leaf. Here is a short tutorial on the flower. Punch one scallop circle from each of these Marvy punches. Take your scissors and cut toward the center on each circle. Once you have done this to all of the circles take your Glimmer Glaze and paint over the top of each circle. 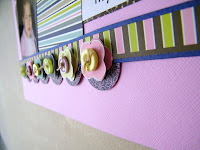 Allow them to dry and then stack and glue them to each other and place your embellishment in the center of the flower. 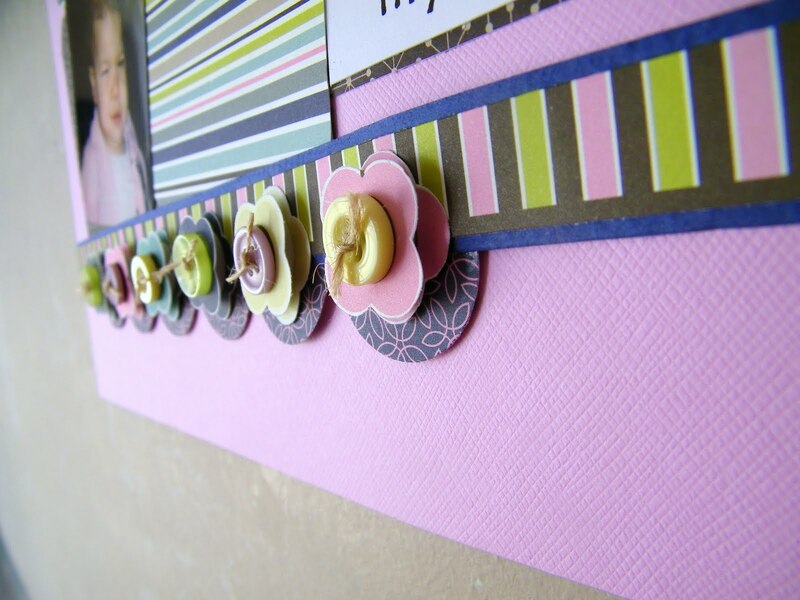 You can then glue the flower to the card and bend the petals up a bit to give them dimension.